The British Gazette » Comrade Corbyn: What will I spend the British taxpayer’s money on? The above image is one of Comrade Corbyn in thinking mode. Thinking is something Comrade Corbyn has had to do a lot of lately. And will have to do so in future. Notwithstanding many extremely unpleasant activists who are members of “Momentum” aka the Comrade Corbyn Appreciation Society, Comrade Corbyn’s heart is in the right place: he wants to improve the welfare of ordinary people and relieve poverty and want. The problem is that this laudable aim is unlikely to be achieved if he pursues certain policies. One of these is the renationalisation of the public utilities. Now, let us be clear: we would agree with Comrade Corbyn when he asserts that Maggie Thatcher should never have broken up the CEGB and sold of it’s assets to the private sector. However, what is done is done and attempting to put the clock back would prove expensive and counterproductive. You see, what was the CEGB has been broken up unto companies like SSE PLC. Now SSE PLC is what is known as a “dividend share” or as those well healed, privately educated and over-paid city types call it, a “divi-stock”. What they mean is that the company (and other’s like it) pay a high dividend in relation to it’s share price. This ratio is known as “yield”. High paying dividends are high yield shares. Generally, when a company pays a very high dividend it is paying the shareholders and not reinvesting that money in the business. Companies like SSE will maintain investment as suitable levels but it pays a good dividend to keep it’s share price up. Buying these shares for the taxpayer and then forcing the company to lower its prices to an extent that it no longer makes a profit will be in effect subsidising SSE’s customers bills using the taxpayer’s money. It will also infuriate many institutional investors who will have lost out if Comrade Corbyn does not pay them the money they were hoping for. Because many are US investors this will infuriate the US administration (whoever is in charge) – which is never a sensible thing to do! So then, how should Comrade Corbyn help those struggling with the choice of heat or eat? By lowering the costs of generating electricity of course! He can do this by stop supporting the subsidising of daft green energy projects like running the Drax power station on wood chippings imported from the USA! The USA is a large coal producer and Drax’s owners could negotiate a very good supply contract which would provide more electricity from Drax’s turbines at much lower cost! But then that would mean emitting more CO2 and that it seems is forbidden! But then there is another source: nuclear power. Here is a FACT: Unless Mr Lerner manages to develop a dense plasma fusion generator (http://www.british-gazette.co.uk/dense-plasma-fusion-fusions-holy-grail/) – don’t hold your breath!!! – nuclear power is the most practical and affordable means of generating electricity without using what is now known as “fossil fuels”. Now, most British Gazette readers will know that at Hinkley Point in Somerset a very expensive pair of nuclear reactors is being constructed. It is being financed largely with Chinese money and the so-called “strike price” is such that these investors will end up very very rich! There is however another project. This is the Moorside project in Cumberland. Of course this is a HUGE problem as Comrade Corbyn will listen to Messrs. Birkby & Roche and a Corbyn government will put the kibosh on nuclear power in the UK. Messrs. Birkby & Roche think that the UK’s energy needs can be met principally by wind turbines, solar power and reducing demand by energy saving. This FAILS to take into account the UK’s rapidly rising population and the natural expectation of higher living standards by the general population! 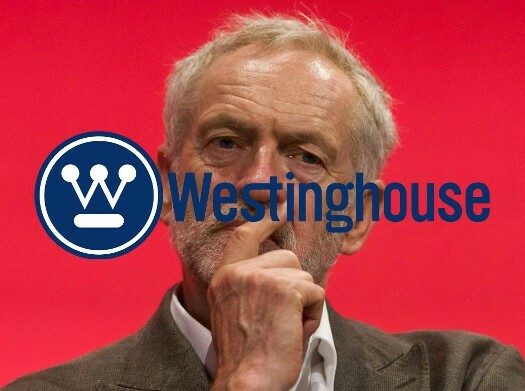 However were Comrade Corbyn to undergo a Damascene conversion, he might consider that a good purchase to make would be of the troubled Westinghouse Electric Company itself! Westinghouse is owned by the Japanese giant, Toshiba and they are desperate to sell this loss-maker. This hardly sounds like a good investment then! Au contraire! The British Gazette believes the company’s troubles are short term and long term, Westinghouse’s expertise in nuclear technology plus it’s broad customer base in the USA means that Westinghouse will once again produce profits as it’s nuclear technology whilst eschewed in the Democratic Peoples’ Republic of Britain (DPRB). Declaration of Interest: The Editor owns shares in SSE PLC.